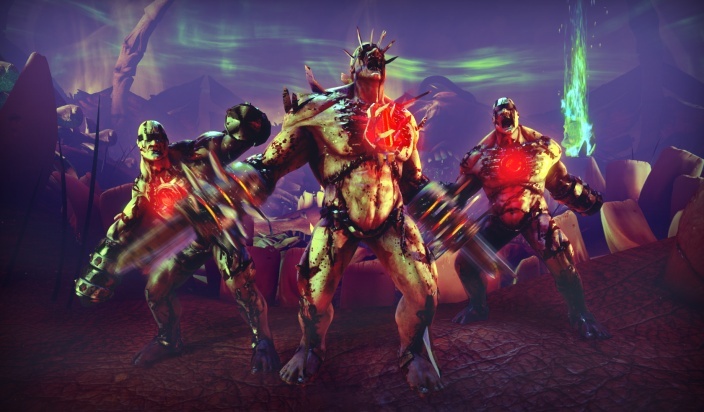 The King Fleshpound is one of the four bosses faced at the end of a standard Killing Floor 2 survival game and also a boss of Poundemonium weekly outbreak. It is a taller and stronger version of its normal counterpart that also uses unique "Whirlwind", "Ground Pound Explosion" and "Chest Beam" attacks and spawns a set of outbreak-exclusive minions named Quarter Pounds. 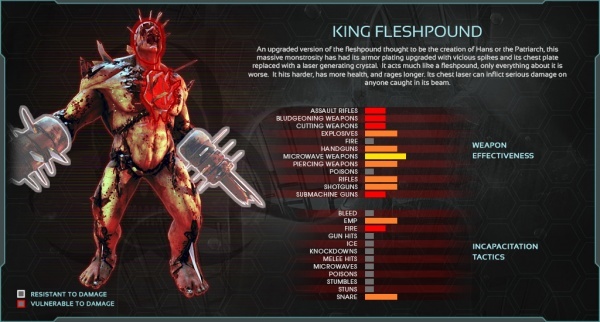 Just like other bosses, King Fleshpound has significant amount of the health which scales up with the additional players. At 6 man HOE server King Fleshpound has 25812 HP and 14750 shield HP. When King Fleshpound's HP is below 20% it pulls out a shield that acts like a second health pool. 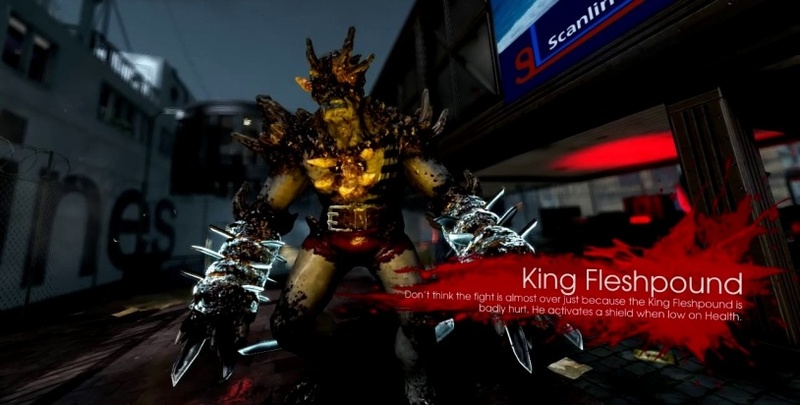 Note that King Fleshpound does not have a head health and cannot be decapitated. 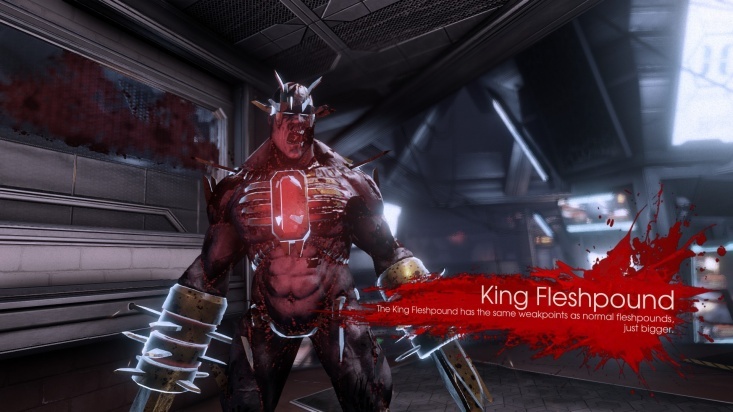 King Fleshpounds have 2 weak spots, which are the head and the glowing plate on their chest. Their arm grinders deflect attacks. King Fleshpounds resists to every form of the damage and have no weaknesses at all. King Fleshpounds mostly using the same attacks as a normal Fleshpounds as well as some new, unique ones - when enraged instead of pouncing or bashing they prefer to use a "Whirlwind" attack which makes them slide on the ground while spinning with their arms at thier shoulder height. By the phase 1 (HP is at 65%) and further, King Fleshpound will start causing a series of explosions underneath it by pouncing the ground with its arm grinders. Each taunt results in total of 4 ground pound explosion where the last one is slightly more powerful than other. When King Fleshpound's HP drops below 50% it also start using a ranged cheast core beam attack. Beam cooldown: Normal - 10 / Hard - 9 / Suicidal - 7 / HOE - 6 plus FRAND (0-1) seconds. Beam attack powers: Knockdown - 50, Melee hit - 50, EMP - 50. After King Fleshpound has a player in his line of sight for 10-14 seconds. Getting hit by a Fleshpound while it is docile will NOT reset this timer. After a King Fleshpound has taken 276 points of damage. Once enraged, King Fleshpound will not stop raging until it successfully land an attack on a player, or 30 seconds after it have lost sight of players. 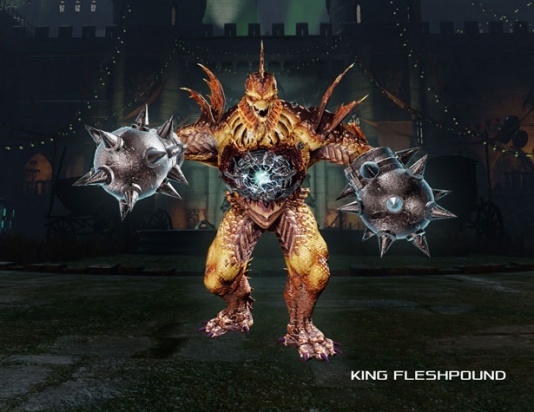 Each time King Fleshpound changes its battle phase (including phase 0, when it appear at the map) it spawns a set of Quarter Pounds, which are the smaller versions of the normal Fleshpound. Quarter Pounds have less health and are slightly more vulnerable against various damage types than normal Fleshpounds. Amount of the Quarter Pounds to spawn laying between (1-12) depending on how many players currently on the server. Based on current HP percentage, King Fleshpound will be changing its battle phases. HP % to change battle phase: phase 0 - 100%, phase 1 - 65%, phase 2 - 50%, phase 3 - 10%. At phase 1 (HP is at 65% or below) King FP will start causing a series (3+1) of explosions upon rage taunting. At phase 2 (when its HP is at 50% or below) King Fleshpound will gain an ability to use chest beam attack. At phase 3 (when its HP is at 20% or below) King Fleshpound will pull out its shield. Rage begins when King FP takes 276 points of accumulative damage. Frustration time, random, between 10-14 seconds. Enraged King Fleshpound will calm down as soon as it land a hit. LOS and hits performed during the King Fleshpound's calm phase has no effect on the next rage starting time. King Fleshpound cannot evade a grenades once enraged. Damage to doors = 120 / 160 / 200 / 680. ZED mass = 200 units, Maximum falling velocity, units / second = 4000. EMP Disrupt prevents following: Taunt, Rage. 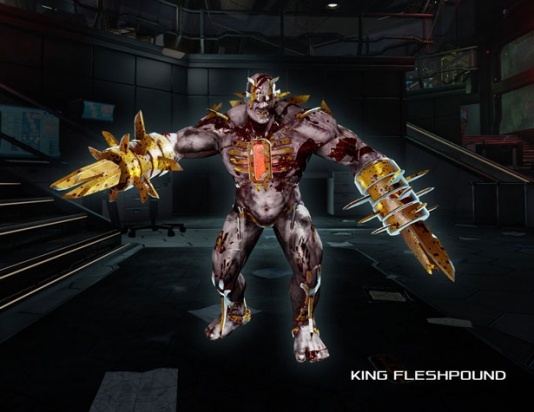 When enraged, King Fleshpound takes only 25% of all incoming weapon powers towards its affliction meter. Rage resistance works like an additional multiplier of x0.25. Final Power Value = Base Weapon Power x Bodypart Resistance x Rage Resistance. Rage will end as soon as King Fleshpound land a hit or 30 seconds will pass without seeing players. After 30 seconds without seeing players King Fleshpound will not be able to enrage, in that case to trigger its new frustration timer it will need to have players within its LOS. Note: After landing a hit the enraged King Fleshpound will update its "last enemy seeing" timer and will immediately trigger a new frustration timer. To make sure that King Fleshpound will not enrage anymore players should let it calm on its own. Enraged King Fleshpound will attempt to play its taunt animation. King Fleshpound can skip this animation completely if at the moment of enragement it will be doing melee attack or any other special move. In such case King Fleshpound will be enraged without losing momentum. 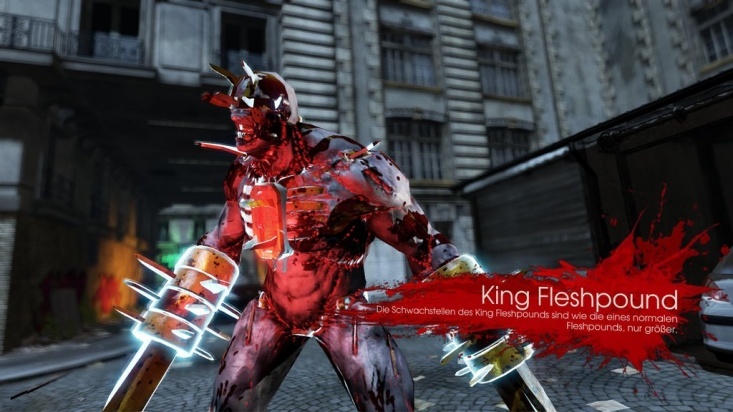 Enraged or sprinting King Fleshpound can do bump damage to ZEDs just by touching them (although ZEDs on its path will likely attempt to evade the threat). Base amount of the damage is 270, multiplied by x2 if King Fleshpound is sprinting and also multiplied by King Fleshpound's difficulty settings. All ZEDs take full damage, Scrake - only 10% of it, Quarter Pound - 25%, Fleshpound - 0%. If by the moment of bump ZED will be having less body health than incoming bump damage, this ZED will knocked down if it would manage to survive (Rioter, for example, as it armor will absorb the damage). Otherwise, if ZED will be having enough health to survive the bump, instead it will stumble. ZEDs damaged in this manner will NOT be considering their bumper as an enemy. King Fleshpound has a chance to block upon taking damage or when being aimed at. King Fleshpound has a chance to evade certain damage sources. King Fleshpound cannot block when enraged. Chance to block after taking damage: Normal - 0, Hard - 0.01, Suicidal - 0.2, HOE - 0.3. Health loss percentage to trigger block: all difficulties - 0.05. Block chains (max): Hard - 3, Suicidal - 4, HOE - 5. Block duration - 1.25s, cooldown - 6.5s. When blocking. Damage resistance: Melee attacks - x0.9, Gun attacks - x0.9. Affliction multiplier - x0.2 (ZED takes only 20% of all incoming powers). Solo game block chance multiplier: Hard - x0.1, Suicidal, HOE - x0.2. Penetration resistance = 5, Parry resistance = 4. King Fleshpound has an ability to destroy closed unwelded doors just by running (bumping) into them. Sprinting required. This page was last edited on 7 April 2019, at 18:04.